Pat will also share the story of Keysight’s recovery since the fire’s destruction. January 17th will be a great time to bring a visitor! President Julia called the meeting to order. Reflection: Jose Guillen – Jose shared a touching letter from a New Gen participant showing that our club touches lives in a positive way and makes a difference. We welcomed two guests today, Bill Bates and former, “when are you going to commit?” member Matt Everson. Ted Athens, Del Roby, Jim Flamson, Bruce & Helaine Campbell, Mike Merrill, Barb Spangler, Kathy Flamson, Valerie Hulsey, Bob & Peggy Rogers, Kevin Everley. Jack Abercrombie is recovering slowly. Richard Lazovick underwent his kidney transplant and he is doing well. Tim Fawcett is recovering from a pretty severe head injury from falling off his roof but is now receiving visitors. Michael Moore was unable to draw the winning marble. 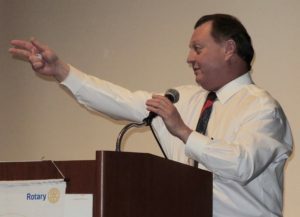 It was the first time in his life he lost at anything…..
District Governor Bob Rogers took over the meeting at this point to introduce the District Governor selection for 2020-21. After sharing his first meeting with Doug at the Munich airport, DG Rogers relieved the suspense (there was suspense?) and introduced Doug Johnson as the new nominee DG Designate for 2019-20. 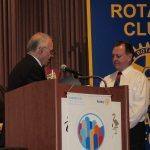 The last Rotarian from our club was district governor was Norm Owen. Congratulations, Doug! Mark Burchill shared that he is back in the office furniture business. He described how he and wife Mel got back into the business after selling Advent Office Furniture. Julia announced that the New Gen project was postponed due to the fire. She announced the need for a couple of volunteers to solicit high schools for applicants for essay contest scholarships. Ted Wilmsen announced that he has 1,900 dictionaries that are ready to go. Ryan Thomas announced that February 14th will be our high school recognition awards. Jackie McMillan is spreading the word for the Rotary River Cruise for Rotarians in 2019. The cruise will be on either the Danube or Rhine River and the hope is that the boat will be filled with nothing but Rotarians. Doug Chase gave a report on the Chase Fund. 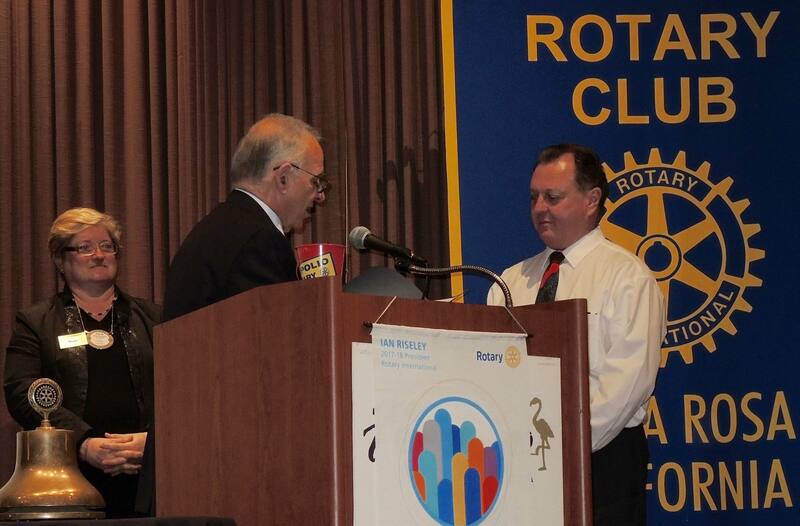 Membership chair, Karen Ball asked members to give out Rotary cards inviting people to be a guest of our club. Our guest speaker called in sick at 10:30 this morning, so a video Ted Talk by motivational speaker Mel Robbins was shown. The subject: How to get what you want. It’s simple, but not easy. We can find everything we need online or in the library, so why don’t we do whatever it is we want to do? I’m fine” is the word that stops people who settle for their life as it currently exists. It keeps you from pushing yourself. We all have the need for exploration and growth. What do we need to accomplish our goals? “Activation energy” is what scientists call it. We all need to get out of our own heads and force ourselves outside our comfort zone. An impulse is killed within 5 seconds if we don’t act. It was an interesting and entertaining program.